Bishop Joseph Angelo Grech DD was installed as the sixth Bishop of Sandhurst in a solemn ceremony at Sacred Heart Cathedral on Friday 27 April 2001. On the 28th of December, 2010 at 62 years of age, the Sandhurst community was shocked with the sudden death of it's much loved Bishop at St Vincent's hospital Melbourne following a brief illness. Monsignor Marriott, the Vicar General of Sandhurst Diocese, said Bishop Grech would be especially missed by the youth of the dioceses, who would remember him by his famous words. “‘God doesn’t make rubbish.’ There is good in all ourselves and we have to pull up and find it. So famous was this expression that he co-recorded a song with Fr Robert Galea entitled "God does not make rubbish"
Born in Balzan, Malta on 10 December 1948, he attended the local schools and the Diocesan Seminary. He left Malta in 1971 to follow many of his people to Melbourne and continued his studied for the priesthood at Corpus Christi College Glen Waverley and Clayton. He was ordained on the 30 November 1974 in his home town and returned to Melbourne to take up parish appointments in Northcote, Altona North, Maidstone and Moonee Ponds and as Parish Priest in Brunswick East. The Archbishop of Melbourne sent him to study Spirituality at the Gregorian University, Rome and on his return became full time chaplain to the Catholic Charismatic Renewal and then to Corpus Christi College provincial seminary as spiritual director. Pope John Paul II appointed him Auxiliary Bishop in Melbourne (titular Bishop of Belesasa). 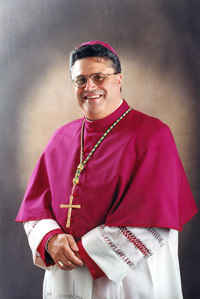 Bishop Joe was consecrated at Patrick’s Cathedral on 10 February 1999 and served in the western suburbs of the Archdiocese. On 8 March 2001 Bishop Joe was appointed Bishop of Sandhurst and installed on 27 April. At the time of his death Bishop Joseph was a member of the Bishops Commission for Pastoral Life with special oversight for the pastoral care of Migrants and Refugees. He was recently appointed to the Pontifical Council for the Pastoral Care of Migrants and Itinerants. Within the Commission for Pastoral Life Bishop Joe was also responsible on behalf of the Bishops of Australia for Youth Ministry. He was also a member of the Bishops Commission for Mission and Adult Faith Formation with particular responsibilities regarding Catholic Missions. Bishop Joe was also a member of the International Catholic Charismatic Council representing Oceania. He was a much sought after international speaker with particular commitment to the Charismatic Renewal Movement, Priests’ Retreats and to Young People. St Kilian’s parish administrator Rom Hayes also paid tribute to Bishop Grech and said it would bring great shock and deep sadness to those who knew him. “He was known as Bishop Joe and that’s what he liked to be called,’’ he said. “He wasn’t one to stand on ceremony and that says a lot about the sort of man he was. He was thoughtful, outgoing and very concerned for people. He poured himself into his work and never backed off." He is remembered as warm and caring and passionate about the things he believed in. Bishop Joe was well known across the Diocese, not only in the Catholic community. He was a prominent leader in Bendigo and was also well known in Australian diplomatic circles. He was respected by all with whom he came into contact. Bishop Joe was proud of his Maltese heritage and equally proud to be an Australian, the wonderful blend of these cultures manifested in the character of this truly great man. He was very close to his sister and brother and Aunty Mary who still live in Malta – he would visit them each year. His Aunt Tess and Uncle Jim who live in Australia were like parents to him – they were at his side when he died. Bishop Joe's funeral was attended by many delegates from overseas and received widespread media coverage. For further information please refer to the tribute page.